Chris Trotter - Shearer Supporter! In Full Cry: In a perverse political version of the blood initiation, members of the Shearer and Robertson factions have guaranteed themselves higher rankings in the Labour Caucus by running down the followers of David Cunliffe. I’M TOLD there were six of them, and that they hunted as a pack. Their prey? Delegates who had voted the wrong way. Moving through the excited crowds at the Ellerslie Conference Centre last November an angry group of Labour MPs was seen taking dissidents aside and telling them, in no uncertain terms, which way was up. Leading the pack was Labour’s employment relations spokesperson, Darien Fenton, and her grim lieutenant, the Dunedin South MP, Clare Curran. No surprises there. Ms Fenton and Ms Curran were among the Caucus members most alarmed by the Labour Party rank-and-file's sudden outbreak of democratic distemper. The other members of the pack, however, came as a surprise. I had never thought of Jacinda Ardern, Megan Woods, Kris Faafoi or Phil Twyford as attack dogs, but my sources assure me that they were there – chewing people out. So what? Such brutal vignettes are the stock-and-trade of party conferences. Certainly “The Pack” was far from being the only example of Caucus aggression at the Ellerslie Conference. It was Chris Hipkins who drew me aside long before the dramatic conference floor-fight to murmur conspiratorially “Our problems aren’t external – they’re internal.” And Andrew Little who first characterised the rank-and-file's bid to democratise their party as a statement of “anxiety” about the leader, David Shearer. Even from the Media Table, the animosity directed towards caucus members who spoke in favour of the rank-and-file’s resolutions (the most effective of whom, by far, was Lianne Dalziel) was unmistakeable. Mr Hipkins youthful countenance became an ugly mask of rage as he railed against the proposition that, to avoid a contest in Labour’s new electoral college, the party leader must be endorsed by sixty percent-plus-one of his caucus colleagues. The underlying cause of all this angst was, of course, simple political arithmetic. The first thing all politicians learn to do is count, and the people backing Mr Shearer were fearful that a democratised party (with sufficient support in Caucus) might decide to wrest the power of choosing the party leader from their hands. They were terrified that the new Electoral College would saddle them with the rank-and-file's choice of December 2011: David Cunliffe. And it wasn’t Mr Shearer’s faction, alone, who were counting heads. Labour’s Deputy Leader, Grant Robertson, had as much to fear from the leadership question being decided early, by the party, as his boss. Now was the time for all who were not for Mr Cunliffe to unite against him. MPs from both factions fanned out across the conference venue to dampen down and/or extinguish the dissident hot-spots. The Parliamentary Press Gallery were encouraged to interpret the rank-and-file’s attempt to “take back our party” as a leadership bid by Mr Shearer’s rival. The roving pack made up of Shearer and Robertson MPs would be joined by an even more vicious media pack led by TV3’s Patrick Gower. 20 November 2012: Mr Cunliffe is demoted and his faction isolated. 4 February 2013: Mr Shearer manages – just – to secure the backing of sixty percent-plus-one of his caucus colleagues. 19 February 2013: Six days before Mr Shearer’s long-awaited shadow cabinet re-shuffle, Charles Chauvel, a supporter of Mr Cunliffe, quits Parliament. 25 February 2013: Mr Shearer’s new line-up is announced. The Pack are well rewarded. Ms Fenton and Ms Curran both rise two places in the pecking order, while Mr Twyford goes up three to take a seat on the front bench. Megan Woods enters the top twenty – a back-bencher no longer. Andrew Little rises with her. Mr Shearer’s chief swordsman, Chris Hipkins, climbs five places to claim the shadow portfolio of Education from Mr Cunliffe’s running-mate, Nanaia Mahuta. Ms Dalziel’s eloquence on behalf of rank-and-file democracy is rewarded with demotion to the back benches. Mr Cunliffe remains outside the magic circle. In Agatha Christie’s Murder on the Orient Express all the suspects are shown to have wielded the fatal knife. Labour’s MPs seem equally impressed by the advantages of collectivised bloodletting. This essay was originally published in The Dominion Post, The Waikato Times, The Taranaki Daily News, The Timaru Herald, The Otago Daily Times and The Greymouth Star of Friday, 1 March 2013. I'm neither a Labour insider nor a Cantabrian. And so my views may smack of ignorance. But I would have thought that Ms Dalziel was the only Labour MP to have performed substantially above minimal requirements over the last couple of years, as tribune for the hard-pressed people of our stricken second city. It seems as if Labour is becoming a party of the Beltway and nothing more. I guess they really don't want people to vote Labour. Who's your source, Chris, David Cunliffe? You've been sold-out for his cause for far too long to be considered any kind of credible commentator. Why don't you tell people you were organising for Cunliffe at the Labour Conference? Your narrative re the right of the party backing Shearer doesn't fit what happened in the reshuffle, so now you've invented "the pack" or been sold it. You really have no idea what is going on, do you? Write what you want, but stop pretending like you're anything other than Camp Cunliffe's chief propagandist, with no sources inside the Parliamentary Labour Party than Cunliffe and his supporters. Labour has lost it's way and is destined to be another political has-been. Shearer is a wimp, Cunliffe is a rightwing socialist so there is no real future for the party. I was a Labour supporter until Lange/Dougals screwed workers in NZ and I have never voted for them since and as things are going, I won't be voting for them again. We have the Gnats and the Gnatlites in the two major parties. We desperately need a party that supports low income workers who make up the bulk of our workforce and have no voice. Coincidence perhaps but I am seeing eerie parallels between the macinations of labour party leader politics and the sith leadership of the star wars saga, one leader, one apprentice , the leader must be killed by the apprentice & a new apprentice found. What other phrase would you prefer? Having positioned myself for 25 years as a political writer prepared to criticise the conduct of "my own side" - when such criticism is warranted - is it really so surprising that aggrieved people come to me me with all kinds of sensitive information? What's more, the less opportunity they are given for expressing their views honestly within (in this case) the Labour Party, the more willing they are to leak information to people outside it. The members of the Labour caucus who have been persecuting David Cunliffe and his followers really need to understand how angry a great many of their comrades have become with the behaviour of the parliamentary leadership. I think the resignation of Charles Chauvel, and Trevor Mallard's response to his valedictory speech, will prove the last straw for many. There is no conspiracy here, my transition from Shearer to Cunliffe has been a very public one, and my reasons for backing him have been set forth in numerous newspaper columns and blog posts. It is revealling, I think, that the lens through which the ABCers look at what is happening, distorts reality to such an extent that any public support for their great enemy registers only as proof of some deep dark plot. They forget that at Ellerslie (in marked contrast to the confines of the Caucus Room) their behaviour was readily observable. "I know what you did last November". You are out of Touch Anonymous @12.15. The main reason that the Polls are not moving in Labours direction despite a dismal National Party is obvious. Swing voters desperately, desperately, DESPERATELY want an alternative to National...but a Shearer led Labour government even makes me nervous, and I'm a long time Labour voter (was a member before Dec 2012). Shearer supporters are either 1) living in denial or 2)Have another agenda or 3) are thick as two short planks and are incapable of identifying what is required to be in government. Just watch a few of Cunliffe's speeches and you will see what is required of a Labour leader! The problem is that when the pathetic ABC'ers lose the 2014 election for Labour, that they once again get on their distorted and fucked up high horse and try to blame the loss on David Cunliffe. This group failed to take accountability in 2011 and it wouldn't surprise me if they tried it again. This pathetic group care more for themselves than they do about the poor and vulnerable of New Zealand. God, you're all talking as if this crap actually matters. Parliament is stuffed full of timeservers and ambitious selfish bastards. The number of people who actually care about the country rather than their own little group, which seems these days to be the middle classes is very small. I'm getting to the stage where I won't vote. "Even from the Media Table, the animosity directed towards caucus members who spoke in favour of the rank-and-file’s resolutions (the most effective of whom, by far, was Lianne Dalziel) was unmistakeable." I recall us being surprised (and for news purposes) quite happy that MPs and delegates were expressing the views that they were. Generally we've been excluded from such debates in the past. I certainly don't remember any of my colleagues expressing animosity at those that were critical of the hierarchy. I do, however, recall you going and high fiving with delegates when the 40% caucus vote remit was passed. I also recall you telling a political editor to "get f**ked" when they joked that perhaps the remit should have had support of 60% of the conference. And I do wonder how it's consistent that the Shearer camp, which had been derided at the time by its critics inept and incompetent, suddenly became Machiavellian enough to co-opt the entire press gallery to their cause? For the record; I do not give a flying bollock as to who leads the Labour Party. I, unlike you, am not a player in that game. hi chris - sean fliegner here - looking at bryce edwards in the herald of 1-3-13, your pages, and mickey savage in waitakere news - dismal. - no one ever bothered to try and nobble us. ever. at conference or anywhere else. shearer's support for 'private warfare' and for 'private mercenaries' is right out of the bush/cheney/haliburton playbook. shearer's hero is esko asho - a finnish politician - not kirk/savage. Sorry Felix - badly worded. I meant that the animosity was clearly visible from the media table which was quite a long way from some of the bitterest speeches. And, yeah, I did speak harshly to Brent. I was really angry - and just didn't get the joke. I'll apologise personally the next time I run into him. You have to remember I was a Labour Party man long before I was a political columnist - and although I haven't been a member for more than 20 years, I was still disgusted at the way the caucus responded to the rank-and-file's assertion of their rights. Apology accepted. Thanks for giving it. I'll be interested to see how the party works out its new candidate selection process this year. I'm hoping it'll be as energetic as last year's changes. I was present at that Conference, and I think Chris Trotter has recorded it accurately, in the same manner as he has analysed the aftermath - the Shearer re-shuffle. Its good to see it out in the open .... Mr Shearer is being given very poor advice from the people who organised the last Labour general election campaign so you can see for yourself just how poor that advice must be! I was present at the Labour conference and I think Chris Trotter has recorded its proceedings accurately. I, too, was told to get lost by one of those MPs when she was persuading someone else on how to vote. And Chris' analysis of the Shearer re-shuffle is spot-on. And btw - to Anonymous at 12.15pm I didn't see Chris T doing any organising for Cunliffe either. Thanks Chris Trotter. Your revelations badly needed. It won't make any difference in the short term. The neurosis and paranoia of the ABC Club and their supporters means they are beyond reasoning with at this point in time. A few of the old hands have got to be sent packing before sanity will prevail. First on the list Trevor Mallard. Annette King is the only one who still has anything of real worth to offer and then only of she comes to her senses. Charles Chauvel has done Labour a huge service, but it may take a few years before it is properly recognised. "Well, I’ve known Chris Trotter for quite a long time, and I think he’s a great writer, ah, I think he might be, um, better at writing fiction these days, ah, and, but I think he’s also a bit like a dog with a bone, and he tends to live in the past a bit in his writing, and, ah he also has hasn’t been a member of the Labour Party for a very long time, but he likes to give us the benefit of his very strong views, so I guess that’s what I’ve got to say I mean, um, you know I that’s not the way I um saw it, and ah you know we had a great conference, and we’ve we’re a united party moving forward." Chris can you please tell us just how different the Ellerslie conference was from the Christchurch one in the 70's that you enjoyed so much as a young radical. Too much personality cult, not enough serious debate on policy - what's changed? From the flavour of your comment I guess Chauvel was spot on the mark regarding New Zealand's 4th estate. ZB is clearly right wing radio. Thank you Chris for exposing this. It had to be said and shows the true problems that Labour (of old) is facing. I have all along had great suspicion towards some MPs, and Jacinda Ardern is one of them. I know of people who sent her highly sensitive and explosive information about welfare issues. Do you think she ever "used" it and raised it? NO, she is a political careerist, towing the line to whosoever is the "leader". All she ever raises are media savvy bits of trivial issues, not what unemployed and sick or disabled on benefits want to hear. I have NO faith in Labour anymore, and I voted Labour repeatedly in the past. My party vote has though increasingly gone to the Greens. I see a total need for not just rejuvination and democratisation, I see a need to found a new LEFT party, that will stand for what Labour once stood for. The party as it is now is just a tiny shade different to what National stands for. Imagine a welfare spokeswoman like Ardern to challenge Bennett on not having cut benefit numbers enough in a recessionary economic cycle. How "Labour" is that, thank you. No, this is it, and Hipkins' rant about Cunliffe that gave me the rest at the end of the last conference. Most of those you mentioned should be voted out next election. Courageous left of centre minded activists, take the step, and found a new, inclusive, progressive, smartly organised and planned new party to the left, please. Many are waiting. Chauvel leaving is pretty much the last straw for me. I have no idea how this whole schamozzle is going to pan out but I remain hopeful that, in the long term, Labour will return as a fully democratised party. Unfortunately I think it is very likely that we're in for another term of National and I can't even begin to think how destructive that would be. Yes, you're right, Peter. I'm utterly devastated. Especially following Clare's fullsome explanation for her behaviour at the Ellerslie Conference. I particularly enjoyed her forthright denial that she and the persons mentioned in my column did any of things I described. Interesting comment re Hipkins . He invest enormous energy into keeping his (falsely) benign mask in place. is New Labour still registered as a party? Does their manifesto support the type of policies the left espouse? Maybe David Cunliffe could revive New Labour? In any case, I think he should do a 'Jim Anderton'! @ Anon of March 1, 2013 at 9:56 PM - Going on the recent Italian election results, I reckon there's enough of us we could crowd-source a new protest political party online. Only need 500 start-up financial members to register, and using social media to build support is free. There's plenty of people that wouldn't otherwise bother voting that would probably register a protest vote. Heaps of unemployed graduates out there to do the work in setting it up. Labour will never be what we want it to be. This is very entertaining stuff I have to say! !No one fights quite as viciously as the left does. @ Jigsaw. Oh, I don't know. ACT and National have both entertained me hugely with their own internecine warfare at various times in both the recent and more distant past. Perhaps you have a short memory, or maybe just a selective one? Shall we do a retrospective? That's because the right regularly roll over for people like Muldoon :-). From afar.....Oz....morons to the left, more to the right in Labour. Shearer et al are it seems a weeks March to the right of that wonderful Nat Muldoon!!! If as it appears Dalziel has been given the .... and Chauvel frogmarched of the set there is no hope. As a former freezing worker all one can say is I would not cross the road to..............them. Those dogs look like border collie fox terrier crosses. 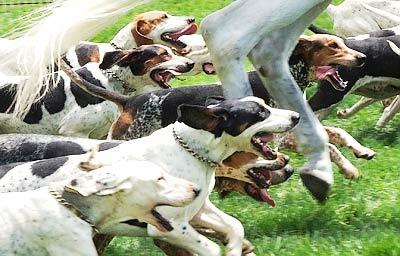 Ummm, Foxhounds - I think. One (minor) comment on an other wise excellent post, looking at the "In Full Cyr" section of your post - shouldn't the last David you refer to be Cunliffe, not Shearer? Grant Hay: Maybe I do have selective memory-certainly at 71 not a short one though. Perhaps it's better to address the issues and not attack the person as those on the left including you seem to prefer. Labour fighting amongst themsleves is certainly not good for them as an opposition or gives much hope for them as a potential government-but then for that to happen they would have to team up with the Greens and guess what-a huge majority of the populace are scared stiff of that. That is where the support for National comes from. Yes, of course it should. Duh! I don't know what they're thinking when they make statements like that but it says something bad about either their sincerity or grasp of reality.. I like a comment Chris Trotter made a while ago on Citizen A, that the fault line between left and right does not run between Nats etc on the right, and Labour etc on the left. It runs right through Labour. Labour will eventually have to move to one or the other side. I expect it to be to the left as that is where the bulk of its party support is (move to the right and it will become a rump lite right party and possibly smaller than the Greens), but it will take a few more earthquakes before it gets there. When it finally gets a true left wing leader, we will know it has arrived. Was my previous comment too vituperative? Karma will eventually catch up with the right wing cabal that is (again) trying to hijack the Labour Party. Did Clare Curren deny that she or any of the named MPs tried to get union members to change their vote? Unbelievable. I was there. I saw it all. It happened as Chris reported. But as others have said above, it is time to focus on policies that will address the growing inequalities in our society.